Carolyn is a valuable member of Stroud and has brought a lot of new ideas that have helped improve and invigorate the club. She quickly and efficiently applied for an Inspire Innisfil Grant which allowed the club to receive almost $10 000 to replace and improve its supply of brooms and grippers, and purchase new helmets and a shoe cleaner at ice level, as well as promote the sport to the community. Carolyn introduced and organizes our silent auction which we enjoy both fall and winter schedules. Her organization and dedication to this fundraiser has been essential to its huge success in support of our junior curling program. Carolyn also worked with local high school teachers to bring high school curling into the club during the week, and works as a liason to ensure they have a smooth experience. She is also responsible for the improved signage at the club and has worked to get temporary signs during registration or special events to help promote Stroud. Her love of curling and dedication to our club has fuelled her to volunteer in many other capacities. 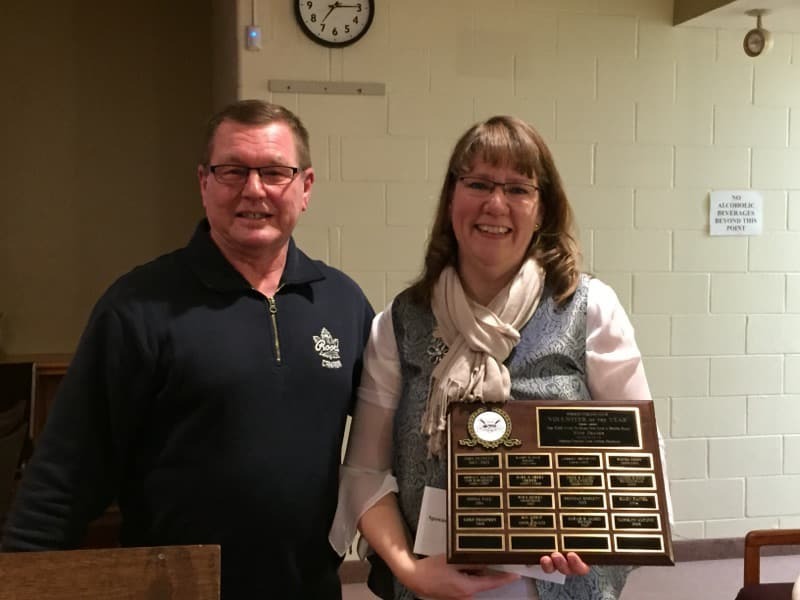 She worked to have one of the largest turn outs for a try curling clinic, helps teach clinics, volunteers in our learn to curl league, volunteers with ladies league, and so much more. Carolyn is always willing to lend a hand and is passionate about helping others, particularly new or junior curlers, to learn to love the sport. Stroud is definitely a better place because of Carolyn! 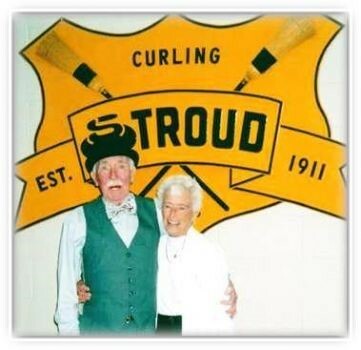 Sarah and James have been dedicated members of the Stroud Curling Club for many years, volunteering countless hours to making Stroud such a great place!! They were the integral part of implementing the new website with online registration and created our Facebook page which Sarah continues to update on a regular basis. Together they have brought new and fun ideas to the Friday Night Mixed League like ‘Glow in the Dark’ curling, meal nights, and even something called ‘Twisted’ curling! Sarah has been the secretary on the Board of Directors for many years and is involved in numerous other roles such as the ladies OCA rep, coordinating the new Learn to Curl League, fundraising, assisting with clinics and implementing a new bonspiel for curlers with 5 years or less experience. Sarah has been a force behind growing the membership at Stroud and getting people to try curling! Although Sarah has been involved in competitive curling since her junior days, James has participated in OCA events as well, both representing Stroud at the provincial level. They are wonderful ambassadors of the Stroud Curling Club and the sport of curling. 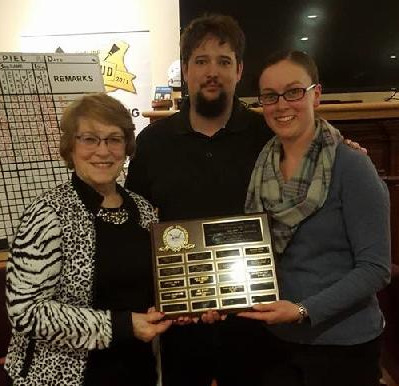 Their love of the game is demonstrated through their active involvement in the club and their drive to continually make Stroud Curling Club the place to be. No matter what the job, big or small, you can always count on the Pictons to be there to help! Edith and Sue are both hard working and dedicated members of the club. Both ladies play an active role helping in the Ladies and Senior leagues at Stroud. The kitchen committee wouldn't be the same without these two! Helping at the many events around the club to help improve the kitchen facilities, they are often behind the scenes making and cleaning up the meals. When the Fresh Look Committee spent over 200 hours sprucing up the club with much needed paint and repairs, you can bet that these two were part of the volunteers involved. Thank you to Edith and Sue, who are always willing to lend a hand and help make the club a better place for everyone! Gord has been a long time board member, President, Past President, and now President again for the next two years. He is a staunch promoter of our club and has for years sponsored events at the club financially. 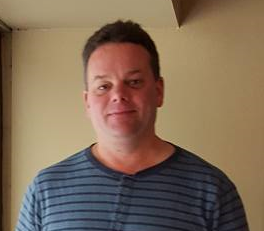 For the past couple of years he has been the bonspiel coordinator and organized the Turkey bonspiel in December and the Valentine bonspiel in February. His business skills make him a great negotiator, idea person and communicator. He is often the voice of reason. He excels on the ice and has represented our club at a variety of OCA events and bonspiels around Ontario. This year his Grand Masters team competed at Provincials in Thornill and if he could curl every night at Stroud we would probably see him there. His commitment to the Stroud Curling Club knows no bounds and we thank him for this dedication. Ellen first became involved in the Stroud Curling Club when her daughters started curling in the Little Rock program. She volunteered to work and run the kitchen, selling cookies, hot dogs and pizza. When her daughters graduated from the Junior program she continued to work in the kitchen and in the last couple of years took her Club Coach certification to be on the ice with both Little Rock and Juniors. Her work has been invaluable to these programs. Her commmitment has been huge! Imagine the number of hours she has contributed every Sunday for ten years in the curling season. She is definiately one of the worker bees of this club and we thank her for years of volunteer service. For several years Brendan has been the league coordinator and organizer of the Monday Night Men's League. He does a great job in promoting the league and keeping league members informed about club news in addition to scheduling league and playoff formats. He is also a member of the Stroud Curling Club Board of Directors responsible for reporting league activities. Brendan was also a member of the 100th Anniversary Committee that planned and coordinated activities for this event. Thank you Brendan for your input and continued enthusiasm in the Stroud Curling Club. Bob and Sherry are members of the Clif Thompson Senior League executive committee, draw masters and Mini-Spiel organizers. Sherry researched and created an Anniversary Calendar celebrating the 100th Anniversary of our club with special focus on the Clif Thompson Senior League. Bob and Sherry initiated, organized and convened the Welcome the World Senior’s Curling event which invited senior curlers from around the world to come to Innisfil and curl with local seniors. They travelled to Scotland to promote the 2nd Annual Welcome the World event and curled in several different clubs. While in Scotland Sherry was the guest speaker at the Tuesday Clubs annual dinner and at each curling venue was given the opportunity to say a few words about the Stroud Curling Club and Welcome the World. For the last two years she has had contact with over 800 Curling Clubs and 45 Curling Federations around the world to promote the Welcome the World event. Bob is a member of the Simcoe Super Seniors as an organizer and phone convener for the Stroud group. Bob was also on the group of volunteers that moved and set up all the lockers and furniture from Barrie. He has coached Junior and Bantam teams over the last five years and has instructed clinics for visiting exchange students. 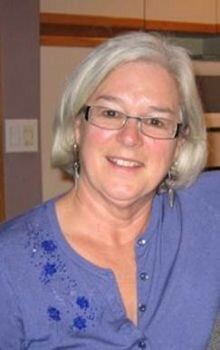 Sherry is also a member of the Stroud Curling Club Board of Directors and is the club liaison for the Ladies League and the Clif Thompson Senior League as well as an OCA representative and website administrator. 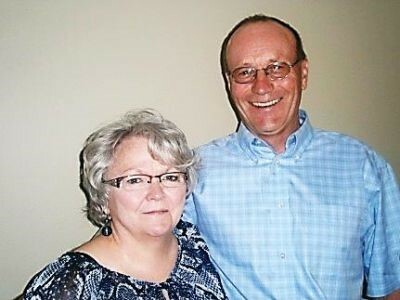 Rick and Laurie are long-time executive members of the Stroud Curling Club. Laurie hosts the Curl Against Cancer Fund Raiser and does most of the baking and cooking herself. Laurie has also been a member of the Stroud Ladies Executive for numerous years as Board liaison, social convener and President. Laurie and Rick were both members of the 100th Anniversary Planning committee and an integral part of the success of those celebrations. Rick was part of the team that constructed the outdoor skating rink for the Anniversary celebrations and Laurie was in charge of the food. Imagine planning food for an unknown number of visitors! 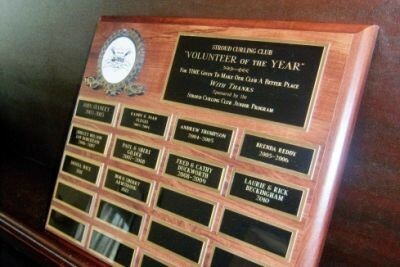 Rick is responsible for hosting the Stroud Turkey Bonspiel and the Stroud Valentine Bonspiel which have been long standing events at the club and continue to bring in the curlers. Both Rick and Laurie are heavily involved in fund raising activities for our club. Laurie is also responsible for coordinating and writing the regular newsletters. She was a key organizer for the upholstering of chairs and locker installation at the club. It does not seem to matter what is going on at the club, Rick and Laurie are somehow linked to that activity and contribute to its success. They can be found at the rink on most nights curling, organizing or serving behind the bar. Whenever there is a job to be done they are there giving of their time, energy and expertise. 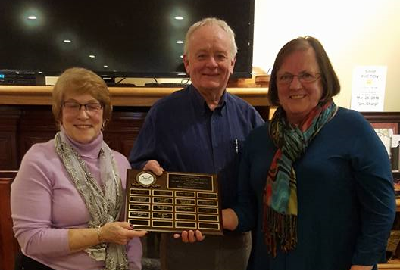 Fred and Cathie have been long time members of the Stroud Curling Club and held positions on the Stroud Board of Directors and Ladies Executive for consecutive terms over the years. Fred was President of the Stroud Board of Directors and actively involved in all aspects of the club and its operation. Fred assisted Sheri Gilder in running the Wednesday Night Choose Your own league and is currently responsible for organizing the Friday Mixed League. He is also a key member of the fund raising committee and helps out at all special events. Fred and Cathie also volunteered and coached in the Junior program. Cathie served on the Ladies Executive for over twelve years in many capacities, most recently as the draw master and rules coordinator. Fred was a member of the 100th Anniversary Committee and integral in getting the outdoor sheet of ice ready for curling. Cathie could be found helping in the kitchen during the Anniversary festivities. Fred is also part of a small group of volunteers that assist in the annual ice installation for the club and always working at ongoing improvements. Fred is also the keeper of the 8 Ender records and diagrams. No job is too big or small for them! It is second nature for them to lend a hand when things need to be done. 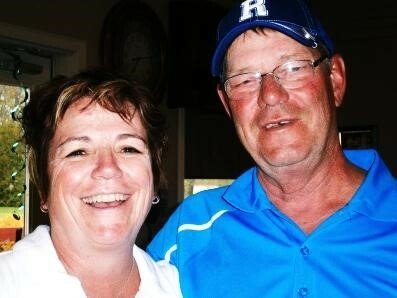 Paul and Sheri Gilder have worked hard to help organize and run leagues and programs at the Stroud Curling Club. 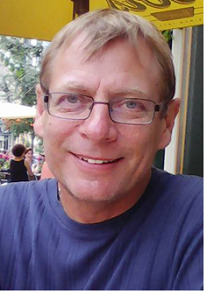 Paul served on the Board of Directors as President and helped to organize special events and bonspiels. He is still actively involved in organizing the Junior program and holds clinics to help people learn the game or improve their skills. He organizes and runs the Sunday Junior program at the club and the success of our Junior curlers is a direct reflection of his commitment. Sheri organized and ran the Wednesday Choose Your Own League which is a season long commitment with all of the statistical data to keep and draws to organize. Her organizational skills allowed the league to operate very smoothly. She was also involved with the Junior program and on the Ladies Executive. Paul is also responsible for setting up and maintaining the Stroud Curling Club website and helped John Stanley with the installation of the cameras. He is part of a small group who annually work on ice preparation and installation and helps around the club to maintain its upkeep. Some people do not need to be asked to do things – they see a need and go about getting the job done. Paul and Sheri are two of these people. Shirley Wilson was one of the people responsible for the start of senior curling at Stroud. 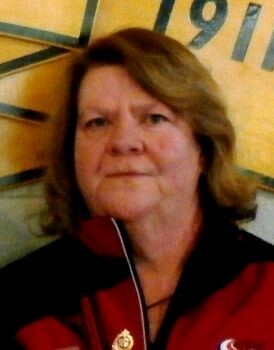 She served on the executive committee of the Clif Thompson Senior league for three years and then remained as the draw master and Mini-Spiel organizer until 2009. This is quite a commitment as the seniors have monthly Mini-Spiels. 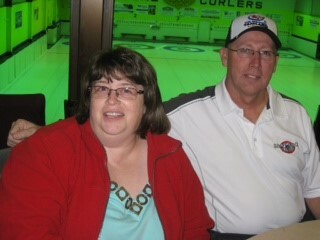 Ian and Shirley were also responsible for organizing the B group of curlers each Monday and Wednesday morning. Regardless of the weather you would find them at the club ready to fulfill their duties. In classic Ian style the names were called for the jitney format very officiously as he ensured that he was properly dressed for the occasion by wearing one of his many hats. They gave up their Clif Thompson Senior League responsibilities only when ill health forced them to quit. Brenda Reddy was an active Board Member and President of the Ladies League in 2003-2004. She was also on the Ladies executive as coordinator of rules and games. One of her responsibilities while on the Board was to log and record membership information. With the help of her husband John, she initiated registrations being sent out by e-mail and helped to streamline data. Brenda was also responsible for collecting information, formatting and printing the Club newsletters. She was consistently on-hand to help out with any fund raisers and where ever she saw the need to help she did with a cheerful disposition. Brenda made a huge impact in a short time. 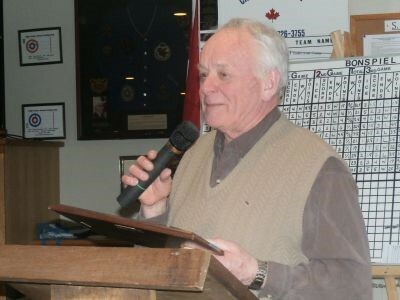 Andrew Thompson was President of the Stroud Curling Club 1997-1999. He was and still is actively involved in many committees and leagues. Over the years he has been very active in the OCA as representative and competitive curler. His Colt team of 2006 won the provincial competition. In 1998 Andrew coordinated the first Tournament of Champions and closing dinner and he still oversees this event. Throughout his time on the Board Andrew has been active in coordinating special events and bonspiels and you know that things will run smoothly when Andrew is involved. He is the chief organizer, draw master and host extraordinaire for the Ontario Curing Tour Comco cash bonspiel held here every year in November. He is eager to help and volunteers to use his organizational skills in writing policies and by-laws. Andrew remains an active and valued member of the Board of Directors with good ideas and practical problem solving skills. 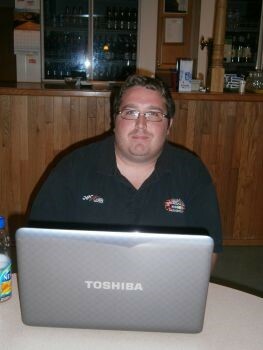 Whenever there is an event happening at the club you will find Andrew there helping out wherever he can! He makes the Stroud Curling Club proud on and off the ice! 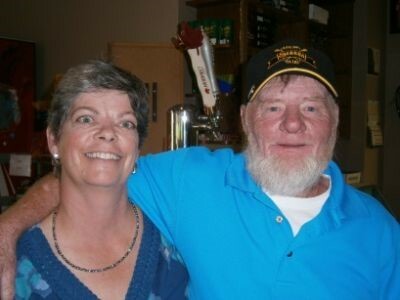 Randy and Joan are an integral part of our Club, its past and the present. They are considered by many to be the “heart and soul of our club”. Randy has served in many capacities on the Board including President and Treasurer. He was part of the volunteer writing team responsible to research and write the history of curling at Stroud. The end result was a book entitled, “The History of the Stroud Curling Club 1910-2003”. Randy and Joan participated in Instructors courses through the OCA and became heavily involved in the development of curling at the Little Rock and Junior levels. Many of the curlers that went through these programs are still active in our club. They ran and coordinated the Little Rock and Junior programs for over 15 years. In 1993 Randy was the key organizer of hosting the Colts and Masters Provincial finals at Stroud. He orchestrated the deal for our club to obtain the lockers and other furniture from the Barrie Golf and Country Club. He can also be seen at the rink doing regular upgrades and improvements. Randy is part of the small group who annually work on the installation and preparation of the ice for the start of the season. Randy is the recipient of the Labatt Achievement Award for Outstanding Service. In recent years Randy was instrumental in the rock handle fund raiser and the purchasing of our new rocks. He was also chairman of the 100th Anniversary committee and he helps organize and run the Choose Your Own League. Randy volunteers his expertise to run clinics for curlers. 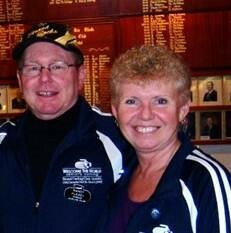 Randy and Joan continue to be very active curlers in our club and continue to promote our club with their positive outlook, hard work and passion for curling. 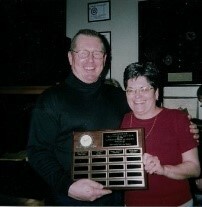 John was the initial recipient of the Volunteer of the Year award. He was instrumental in installing the clubs computer system, the cameras for on ice-viewing and the monitors. This system enables our off ice skips to be able to call the shots much easier as they can see both ends of the ice from the comfort of the lounge. John was also a member of the Stroud Curling Club Board responsible for Special Events. His “I can do that” attitude was a reflection of his involvement in the club. Thank you, John for bringing our club into the technology era. He continues to support the club as a member.